That's the way it's setup in the demo and in the makers blog http://www.lucadentella.it/2012/03/16/orologio-nixie-3-rtc-ed-expander/3/, yet I don't get any response from the LED's. and was able to get it to compile, but still not a blink from any of the LEDs. 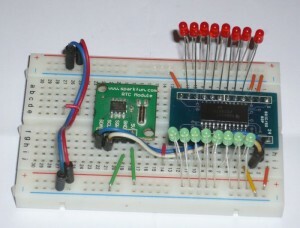 I/O pins need pull up resistors to VCC. I didn't use any resistors because the demo didn't include them. What am I doing? Description: Have you run out of I/O pins? This great IC allows the user to expand up to 16 I/O using only two I/O for control! The PCF8575C is controlled through an I2C interface and features 16-bits of quasi-bidirectional input/output pins. Checkout the datasheet for more info! does this compile / work (make the LED's turn on / off) ? Yes cjdelphi that looks like what I've got. even with the resistors all LED's remain LOW (off). Any ideas on what's wrong? As far as I can tell the difference lies between the PCF8575 used in the demo and the PCF8575C which I'm using. Although I'm not exactly sure how to compensate for that difference just yet. So at the moment you can turn on the leds, even if they are very dim? Here's my wiring. LEDs flicker very dimly you almost can't even tell they're on at all. (as wired lucadentella's demo) Think my next step is to add resistors to each i/o. (sorry I was away for my job): did you resolve your problem?